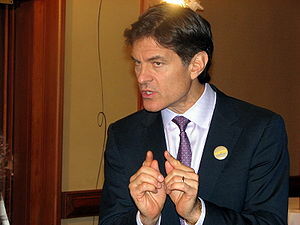 TV HOST DR. OZ HEAVILY PROMOTES SWINE FLU VACCINE…WHILE REAPING IN BIG BUCKS FOR VACCINE RELATED STOCKS | Dy'er Hear? Dy’er Sez: It wasn’t that long ago that I posted about Dr. Oz making the rounds on the TV news telling people how they should all go get their swine flu shot. The first alarm bell that rang in my head concerning Oz’s campaign to get people vaccinated was that he admitted during a news interview (video at bottom of story, or go here for the original post) that he would not be vaccinating his own children even though he was pushing for others to get the shot or to have thier children innoculated. This entry was posted in Corruption, Health, Media, Pharma, Swine Flu. Bookmark the permalink.